It’s always wonderful to attract volunteer runners whose work gives them a deep understanding and empathy for the people we help. That’s definitely the case for Joe Andruzzi Marathon Team member Erin Daly, a 28-year-old speech pathologist from Somerville, Mass. Thank you for your time, dedication and energy, Erin. We hope you meet your goal and have a blast on Marathon Monday! Erin: My career has led me to work with many very sick patients who are hospitalized and undergoing the stress of medical treatments, as well as experiencing the everyday stress of financial responsibilities for themselves and their families. This charity targets a population that I am quite familiar with, and I very much respect this cause. Erin: I am inspired by all of the people who go through so much more pain and stress than I hopefully ever will have to. And I see running the marathon as a way to put things in perspective. Erin: This will be my third Boston Marathon. I ran in 2009 and 2010, also for charity. Erin: Have FUN! My first marathon was a great success, because that was my goal, just to finish and have fun. When you get bogged down with all of the details and minutes and seconds, I think the experience of the Boston Marathon can be forgotten. 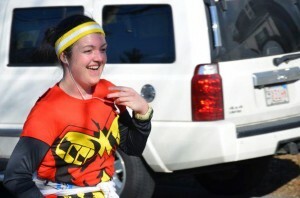 Erin: I run to prove to myself that I can do it. I have met most of my Boston friends through running, so it also makes a great social outlet, as well. Erin: Training has been interesting this year. I started from scratch, having not run consistently in over a year. I began training and my long run was 5 miles. I built up every weekend from there, until I got to 15 miles. I try to run three to four times per week and cross-train a bit, but my schedule is often challenging. I have recently had a small injury, which has been an experience, as well. Luckily, I have a fantastic physical therapist! Erin: To finish and have a blast doing it. Erin: I had a party at my house that I charged entry for, with food and drinks provided. Sam Adams was nice enough to donate a majority of the beverages. I am also selling numbers 00-59, with the winning number being the one that matches the seconds in my official race time, and taking one-third of the pot of money to donate. Erin: I have previously raised money for another local charity through the Boston Marathon. Erin: I am so honored to be a part of this team and cause. I believe in this charity, and can’t wait to sport its logo on Marathon Monday!